A crisp, November morning welcomed riders to the opening round of Portsmouth MX Club’s winter series at West Meon, and despite heavy rain the previous day, the track was rideable and made for some interesting and entertaining racing. First out were the Rookies, with a number of riders moving up from the big wheeled class, enjoying their first outing on the bigger machines. Brandon Hickman was super-quick all day and didn’t put a wheel wrong, and after powering out of the gate he romped home to secure two race wins and the overall, punching the air with delight. An inspirational ride from such a nice lad, totally stoked with his victory. Sonny Smyth wasn’t far behind, and followed Hickman home in each moto, a brilliant set of races rewarding him with second overall. Callum Allison couldn’t have started the day of any better, after following a superb opening lap from Jesse Wren who took the lead, a mishap denied him keeping first place and Allison took control of the group. A brilliant race win plus two thirds secured him third overall. The biggest group of the day were the mighty Autos, who, despite having to deal with mud deeper than their wheels, still bravely worked their way around the hilly circuit. Archie Edwards was set for a straight of wins, but a tumble in the latter stages of the opening moto denied him, but going 2-1-1 he still secured the overall. An outstanding effort from Troy Kennett who kept his cool and charged hard to keep his eyes on the prize of a race win, his patience was rewarded and a brilliant first race win gave him his best result of the year. Added to two second places, his hard work was rewarded with a second overall. Two up-and-coming new riders in the shape of Toby Bond and Archie Webber followed the front runners in spectacular style. Bond improved as the day wore on, an outstanding third spot in the final moto rewarding him with third step on the podium, just in front of birthday boy Webber who secured his best result to date by finishing in fourth. Despite the low numbers, the big wheels still provided some great racing from start to finish. Robert Storer was on form all day, narrowly missing out on a straight set of wins, but still came away with the overall, a brilliant end to what has been a great year for him. James O’Mara in his first big wheel race definitely showed champion potential, and despite a couple of spills near the finish line, he still finished second then a brilliant first rewarding him with second overall. Alfie Card returned to Portsmouth and put in a challenge for the lead, improving his results as the day wore on. A great effort going 4-3-2 ensured Card went home with a podium position, third overall. The old-timers of the Premier class didn’t disappoint with rapid racing from the drop of the gate, great to see some old faces back with the club. Jamie Cooper had to settle for second in the opening motos, but saved his best performance for last, winning with ease in race three to take the overall victory. Despite a few tumbles, Paul “Finesse” Spacagna certainly showed why he was club champion in 2012, a brilliant race win starting his day off in the perfect way. Keeping on the pace of the leading duo after his spills, he finished in third spot to grab the runners-up place ahead of Wildman Willis. Great to see Wildman back at his former club, and in true wild style, a crazy crash after leading the first race saw him struggle back to seventh place. But back in his usual spot in race two saw him lead from start to finish, then a second place rewarded him with third overall. Another great turnout in the small wheel 85 class, with Joshua Bassett leading the way. With riders chopping and changing positions from the drop of the gate to the finish flag, Bassett kept a cool head and did enough to ensure he grabbed the chequered flag in each race, three race wins and the overall. Jake Cappa had to fight off challenges from Luke Richardson and Tyler Kirby, but pushing hard all the way to the finish line, going 3-2-2 rewarded his efforts with seconds overall. Kirby rode a set of steady races, picking the right lines and comfortably stayed in the top six. Going 4-3-4 he finished the day in third overall. It was like a Rookies reunion in the MX2 class, with both Charlie Razzell and Todd Leadbitter in their first races in the adults taking charge, and romping away from the rest of the pack. Unfortunately a spill for Leadbitter denied him the overall, redeeming himself in the final two motos to take the wins, and take home second overall. Charlie Razzell was on a mission, and wasn’t far off Leadbitter’s pace, keeping him in his sights to come home in second, but a brilliant debut race win in the opening moto secured him top spot. George Smith was back to his old self, brilliant speed and precision ensuring he finished high up the leader board. A great performance from Smith going 3-4-4 secured him third overall. Juniors were next and there was no disputing the overall winner, young Charlie Hucklebridge making light work of the dense, sloppy conditions, romping home to three easy wins to take the overall victory. An absolutely outstanding effort from Jacob Collins who, in only his first race meeting on the geared bike, managed to carry on where he left off in the autos, crossing the line in second, and then going 3-3 to proudly take home second overall. Kieran Paget wasn’t far behind, and rode a super-smooth set of races, saving the best for last as he powered into second spot in moto three. A great end to his day, finishing in third overall. 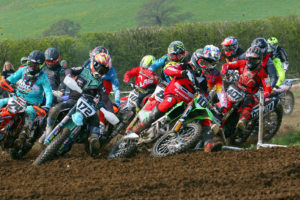 Last out were the mighty MX1 boys, some super-rapid riders contending for the race win. George Purchase was quick out the gate and remained in the lead to secure moto one. Nicky Watts quickly took over the lead in the remaining races, but Purchase stayed ahead by a couple of points to take the overall. Watts had a disastrous opening moto, with the bike cutting out and refusing to start, he fought hard to work his way back into fourth spot. Totally dominating the final two races to secure the wins, he ended the day in second overall. Like a spring chicken, Greg Hanson showed the younger boys how it’s done, a master class of perfect riding, taking it easy to comfortably finish in the top three all day, going 2-3-3 to secure third overall …… watch out Greg – Todd’s right behind you!!! 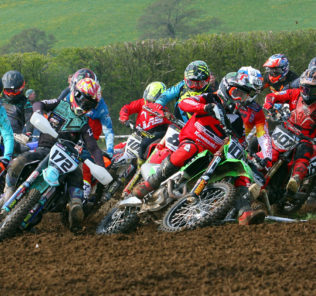 VMX: 1 Jamie Cooper, 2 Paul Spacagna, 3 Paul Wildman Willis, 4 Yan Dixon, 5 Stuart Perry, 6 Darren Miles. MX2: 1 Charlie Razzell, 2 Todd Leadbitter, 3 George Smith, 4 Harry Day, 5 Craig Cartwright, 6 George Johnson. MX1: 1 George Purchase, 2 Nicky Watts, 3 Greg Hanson, 4 George Gough, 5 Todd Leadbitter, 6 Ricky Carter. Rookies: 1 Brandon Hickman, 2 Sonny Smyth, 3 Callum Allison, 4 Jesse Wren, 5 Jason Warren, 6 Ben Richards. BW85: 1 Robert Storer, 2 James O’Mara, 3 Alfie Card, 4 Jake Wotherspoon, 5 Zak Chadd, 6 Max Aspden. SW85: 1 Joshua Bassett, 2 Jake Cappa, 3 Tyler Kirby, 4 Luke Richardson, 5 Connor Williams, 6 Fletcher Ridout. Juniors: 1 Charlie Hucklebridge, 2 Jacob Collins, 3 Kieran Paget, 4 Travis Barnes, 5 Archy Atkinson, 6 Casey Kennett. Autos: 1 Archie Edwards, 2 Troy Kennett, 3 Toby Bond, 4 Archie Webber, 5 Theo Percy, 6 Jack Dugmore.